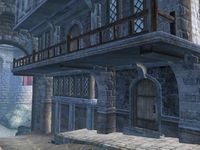 The Surilie Brothers' House is a home located in the southwest part of Skingrad. It is situated beside Glarthir's house and across from the Two Sisters Lodge. It is the residence of the Surilie brothers, Davide and Gaston, and consists of two zones, Surilie Brothers' House and Surilie Brothers' Basement. The house that the Surilie brothers share is spacious and well-furnished in a middle-class style. Upon entering, you will find yourself in a small lobby containing two chairs that each have a painting hanging above them. North of this lobby is a small dining room that is kept warm by a cozy fireplace. In the center of the room are two chairs and a table that holds two oranges resting on a tan plate, a quill with an accompanying inkwell, and a copy of the House Upper Wall Hangings for Rosethron Hall. Should you pick these up, it will save you from having to purchase the upgrade yourself. In the southwest corner of the room is a cupboard that contains some clutter. 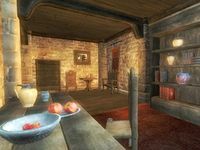 In between the fireplace and the locked door that leads to the basement is a cabinet holding a selection of tan and metal dishes. After climbing the stairs to reach the second floor of the house, you will find yourself in a fairly empty area containing two tables and a chair along with two doors. The western door leads to an outside balcony while the eastern door will take you to a study. Shortly after entering the study, you will find a table holding a clay pitcher and cup situated in between two chairs. In the western part of the study is a cabinet holding some tan dishes and a modest selection of common books. Near the cabinet is a chair and a table that holds two apples on a metal plate, two strawberries in a metal bowl, and a few more tan and metal dishes. Immediately after you head up the stairs to reach the third floor of the house, you will notice that it is not nearly as empty as the second floor. Just south of the stairs is a chest that holds clutter. 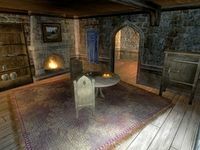 In the area west of the stairs and near the windows is a table with an accompanying chair and three barrels that all hold clutter. In the southern part of the third floor you will find three barrels and two chests that all contain clutter. Two bedrooms can be found behind the two locked doors located on this floor. Upon entering the northern bedroom in which Davide sleeps in, some drawers containing clothing can be found to your left and a cupboard containing more clothes is located to your right. Near the windows of the room is a double size bed, a desk that may contain some reading and writing materials, and a chair. The southern bedroom that Gaston sleeps in greets you with a cupboard containing clothes to your left and a set of drawers containing more clothing to your right. A nirnroot rests on top of the set of drawers. 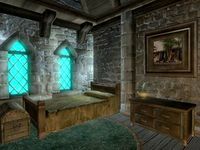 Situated near the windows of this room is a double size bed and a locked chest that contains some loot. Like many other homeowners, the Surilie brothers use their basement for storage. After heading down two sets of stairs, you will find yourself in a small, one-room basement. 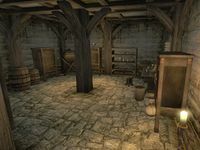 Just west of the stairs is a cupboard containing clutter along with two sacks that contain more clutter and a grain sack. South of the cupboard is a stool and a table that holds three ears of corn and a head of lettuce inside a basket, a pumpkin, and a selection of pewter silverware. A garlic cluster hangs in between this table and the cupboard to the north of it. In the vicinity of the table is a barrel containing some food and a shelf holding a selection of pewter dishes. In the southeast corner of the basement to the east of the shelf are two cupboards. The cupboard that has a pewter pot on top of it holds some beverages while the other cupboard contains some food. North of these cupboards are two barrels that contain food and a cabinet that holds two loaves of bread, two ears of corn, a head of lettuce, and a pumpkin. The key to the house is carried by both Davide and Gaston. This page was last modified on 8 July 2018, at 12:38.